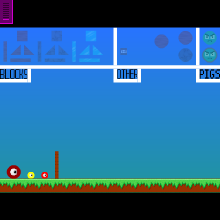 Now, making an Angry Birds Level is easy! Click and drag tools for the pig's fort and drag the birds to play it! Pick from ice, wood, and stone! Use circle blocks to make pig-busting contraptions and using ramps can add a little extra strength to the fort! Build a level, and share it with your friends. Most of all, enjoy! Current Version: 1.0.3 Blocks Added. Tools moved. Version 1.0.2 Labels on object groups added. Version 1.0.1: Right facing ramps added. Version 1.0.0 Wood, ice, stone blocks and left facing ramps. TNT, round Blocks, and two strength of pigs.